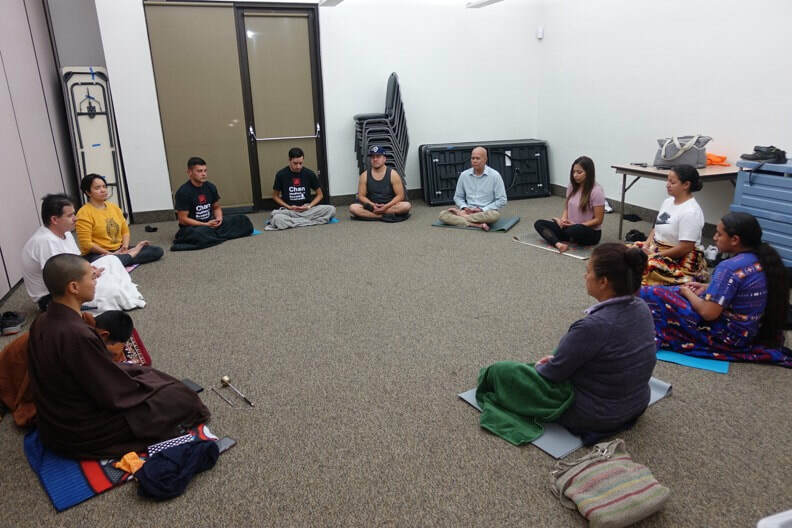 Chan Meditation classes are now offered in various areas of Los Angeles. These classes are open to public and suitable for all levels, ages and with all religious affiliations. You may register through the links below or drop-ins are welcome. View Calendar on meetup. - How to sit and meditate in proper posture. - Learn various techniques of meditation. - How to keep making progress in your practice. All levels, religions, ages welcome. Registration not required in advance. Bring your own yoga mat or sitting mat. All levels, religions, ages welcome. Why do we practice Chan? Chan is for everyone. We have people who practice Chan meditation regularly who are Catholics and Christians. We have meditators who are Americans, Mexicans, Koreans, Chinese, Vietnamese, Europeans and more. We welcome everyone so that you can benefit from it too.